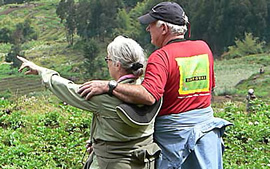 The 10 days Rwanda safari is an exceptional package taking you to Volcanoes national park to see mountain gorillas, Nyungwe forest national park for chimpanzees,canopy walk, Akagera national park for game viewing and a hike to Dian fossey grave. On arrival at the airport, you will be received by our company representative who will transfer you to Five To Five Hotel(budget)/Flame Tree Village (mid-range)/ Mille Collines Hotel (luxury)Day 2: Transfer to Akagera National park and evening game drive. Day 4: Transfer from Akagera to Nyungwe National park. In the morning, you will set off to the forest for chimpanzee tracking adventure. If in Kibale, the Bigodi wetland sanctuary nature walk is a highlight in itself – meet different monkey and bird species .Dinner and overnight at (day 4). Day 7: Transfer to Volcanoes national park. Day 9: Golden monkey/Dian Fossey. Day 10: Boat cruise and transfer to Kigali. In the morning, you will enjoy a boat cruise up to the coffee island, and have a view of the sorrounding islands. 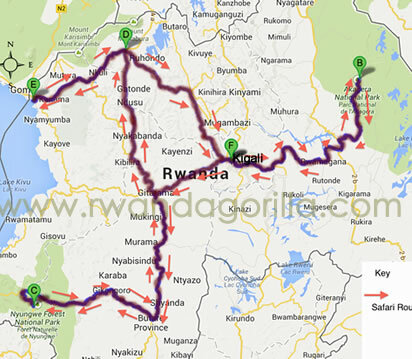 On return, set off to Kigali, where you will reach early to have the necessary shopping. You will then check in your hotel or be dropped to the airport for your departure flight if it is on schedule.